Ciao! 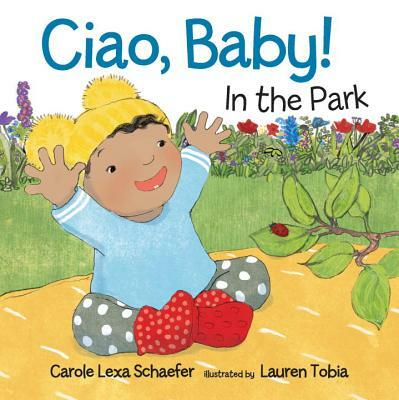 A pair of cute and colorful board books from Carole Lexa Schaefer and Lauren Tobia introduce a curious, lovable tot eager to explore the world. When Baby and Nonna head to the park for the day, what will they see? There’s a squirrel — Ciao, Squirrel! — and a grasshopper — Ciao, Grasshopper! Baby scoots over to meet them and share a friendly hello. Who else might be hiding around the park? Ciao, animals! Ciao, Baby! Carole Lexa Schaefer is the author of many acclaimed books for children, including Down in the Woods at Sleepytime, illustrated by Vanessa Cabban, and the Monkey and Elephant early reader series, illustrated by Galia Bernstein. Carole Lexa Schaefer lives in Washington State. Lauren Tobia is the illustrator of several books for children, including Baby’s Got the Blues by Carol Diggory Shields, Happy in Our Skin by Fran Manushkin, and Are You Sure, Mother Bear? by Amy Hest. Lauren Tobia lives in Bristol, England. In this charming duo of board books, a bubbly baby explores the world around them...Simple text and clear ink-and-pencil illustrations make these board books developmentally appropriate and winning choices for choral reading in storytime. A first purchase.